The dedication of Tall Hall and Chum Run on Bear Creek at Belmont University in Nashville, Tennessee, August 18, 2018. Visible from countless spots around the city, Belmont University’s newest residence hall officially opened its doors today to welcome the 610 residents who will live in the building this year. Dubbed “Tall Hall,” the facility includes a basement and 10 floors and sits atop a hilly area between 12 South and 15thAvenue. The structure’s top floor, based on overall elevation, represents one of the highest points in Nashville, offering tremendous birds-eye views of downtown. Moreover, a new picturesque scene on the campus’ southeast quadrant was unveiled with Tall Hall’s dedication today, as the building is bordered by large green space and a babbling “Bear Creek” that features a bronzed bear sculpture, “Chum Run,” crafted by acclaimed Wyoming visual artist Sandy Scott. The area surrounding Tall Hall is enhanced by the unveiling today of Chum Run, a large bear sculpture that provides a clever nod to the University’s athletics nickname, the Bruins. Chum Run was created by Sandy Scott, who received her formal art training at the Kansas City Art Institute and later worked as an animation background artist for the motion picture industry before taking up sculpting in the 1980s. She has received awards for sculpture and etching from the Allied Artists, Pen and Brush Club, American Artists Professional League, Catherine Lorillard Wolfe Club, National Academy of Western Art, Society of Animal Artists and the National Academy of Design. Headquartered in Lander, Wyoming, Scott is an avid outdoorswoman who loves to hunt and fish, and she believes wildlife artists should be in the field to accurately present their subject to the viewer. 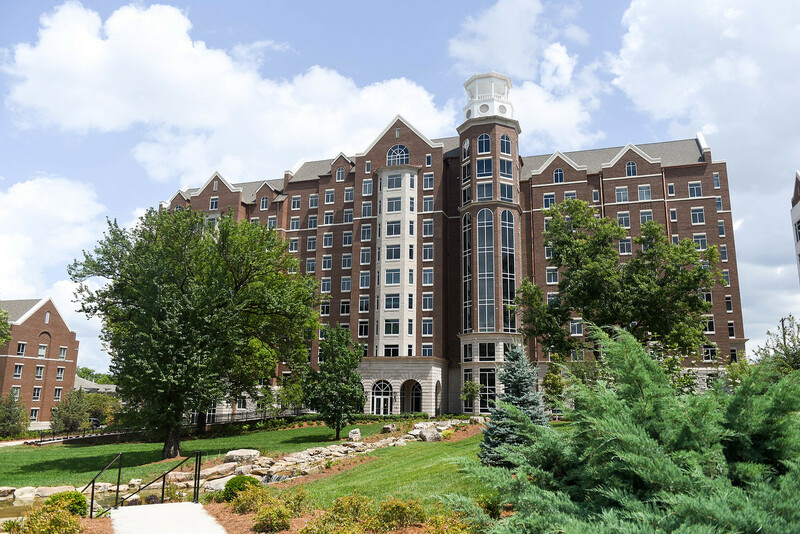 At 243,000 square feet, Tall Hall represents Belmont’s largest residential building to date. The $78 million complex includes a fitness studio on the ground level to provide workout opportunities close to students’ homes. The new facility features suite and apartment-style options, including many single room opportunities that were attractive to returning students. Moreover, Tall Hall features innovative new modular furniture that gives students countless choices for how they set up their spaces. Belmont continues its commitment to sustainable buildings with this project, as this is expected to be the fourth campus building to achieve LEED certification. Occupancy sensors, nearby material sourcing, variable refrigerant flow (VRF) HVAC system and low VOC paints are just a few of the features that contribute to ensuring less impact on the environment from this new construction.